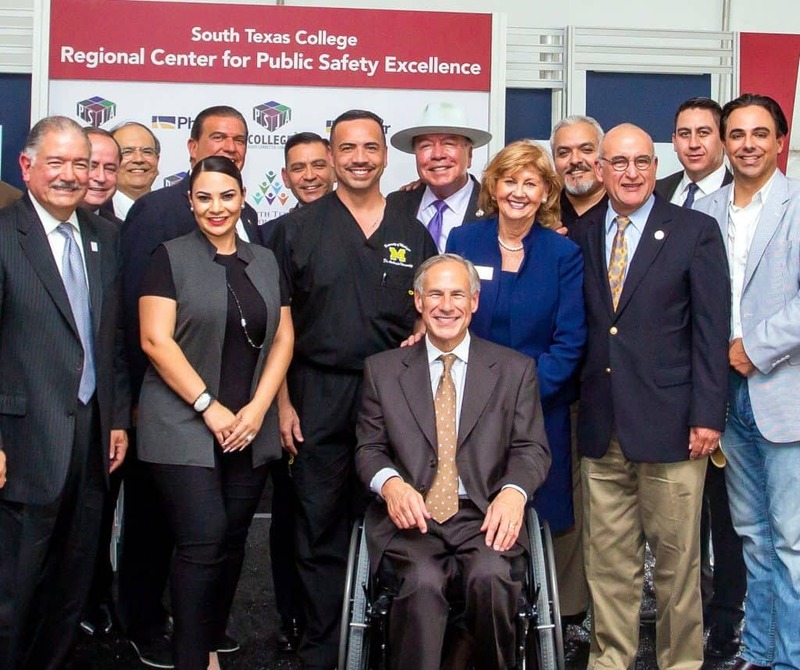 Featured, front row, from left: Paul Rodríguez, Chairman, Board of Trustees, South Texas College; Victoria Cantú, Member, Board of Trustees, South Texas College; Ambrosio Hernández, MD, Mayor of Pharr and the Chief Medical Compliance Officer, DHR Health; Gov. Greg Abbott; Dr. Shirley Reed, President, South Texas College; Rep. Roberto “R.D.” Guerra, D-McAllen; and Rep. Terry Canales, D-Edinburg. Back row, from left: Dr. Daniel King, Superintendent, Pharr-San Juan-Alamo Independent School District; Fred Farías, III, OD, FAAO, Member, Texas Higher Education Coordinating Board; Sen. Eddie Lucio, Jr., D-Brownsville; Commissioner representing Labor Julián Álvarez, Texas Workforce Commission; Sen. Juan “Chuy” Hinojosa, D-McAllen; Rubén Cortéz, Jr., D-Brownsville, Member, Texas State Board of Education; and Jorge Zambrano, Assistant Secretary-Treasurer, Board of Trustees, Pharr-San Juan-Alamo Independent School District. 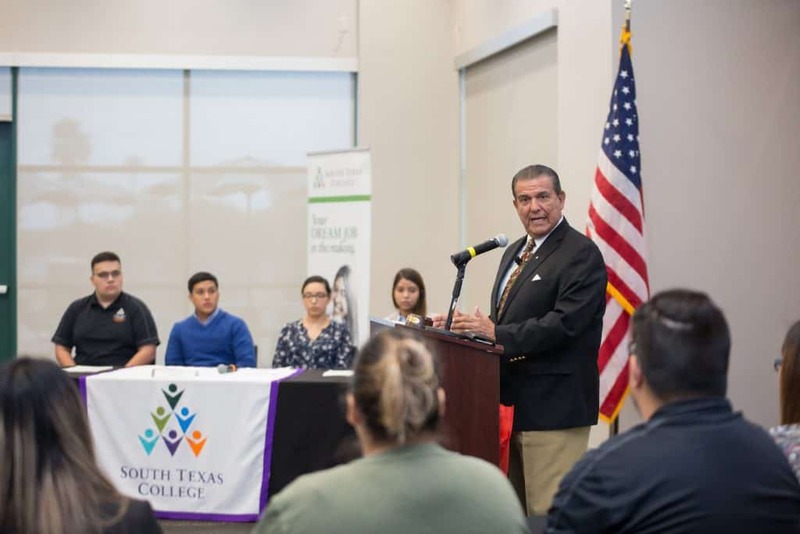 Featured: Student Government Association at South Texas College hosted Sen. Eddie Lucio, Jr., D-Brownsville, at a town hall-style event at the STC Pecan Campus in McAllen on Thursday, October 18, 2018. Lucio spoke about the importance of voting ahead of Election Day on Tuesday, November 6, 2018. 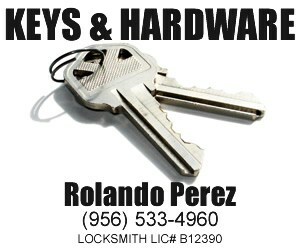 Lucio’s presentation took place in the new Student Union Building, 3201 W. Pecan Boulevard in McAllen. Featured: At the front podium on the floor of the Texas House of Representatives, Rep. Terry Canales, D-Edinburg, on Tuesday, February 7, 2017, praises the virtues of the Rio Grande Valley and its beneficial economic and social impact on Texas and the United States. Flanking him, from left, are: Rep. Óscar Longoria, D-La Joya; Rep. R.D. 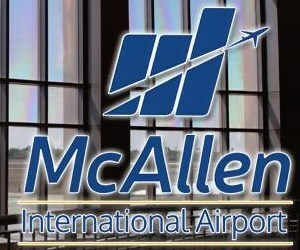 “Bobby” Guerra, D-McAllen; Rep. Armando “Mando” Martínez, D-Weslaco; Rep. Ryan Guillén, D-Rio Grande City; Rep. René Oliveira, D-Brownsville; Rep. Eddie Lucio, III, D-Brownsville; and Rep. Sergio Muñoz, D-Mission. 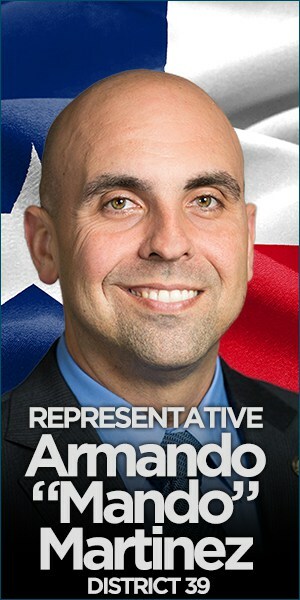 Deep South Texas continues to grow as one of the state’s most important regions for trade, commerce, and culture, state lawmakers were reminded on Tuesday, February 7, 2017, during Rio Grande Valley (RGV) Day at the Texas Capitol, the Edinburg Economic Development Corporation has announced. 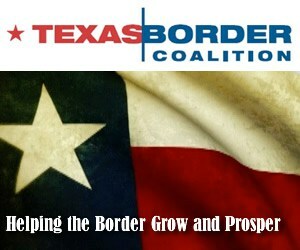 Among the messages delivered to the state leadership was the Texas Legislature would be wise to continuing investing state resources and creating state laws and policies that will help the region’s extraordinary transformation in the past two generations from once being a major agricultural and ranching area, into building on its status as a growing national center of international trade, energy development, even future space flights. 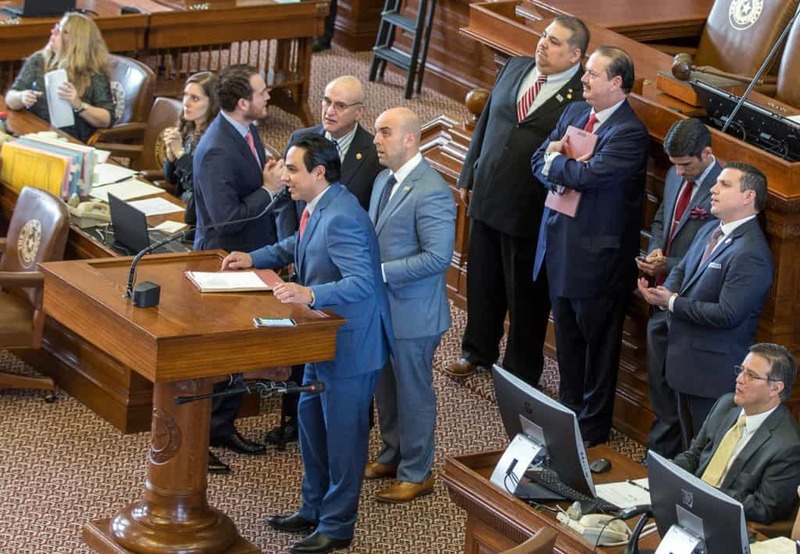 Those were among the highlights pointed out to the 181-member Texas Legislature and other statewide officials, including Gov. Greg Abbott and Texas Land Commissioner George P. Bush, who met with a large delegation of Valley business, community, and political leaders during the one-day lobbying effort. 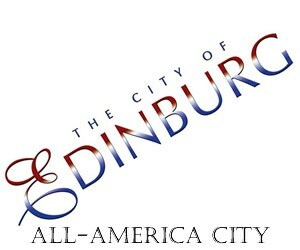 Included among the 35 organizations and the more than 200 individuals who participated in the day-long event were the Edinburg Mayor, Edinburg City Council, the Board of Directors of the Edinburg EDC, the Edinburg Chamber of Commerce, and the Edinburg Consolidated Independent School District. 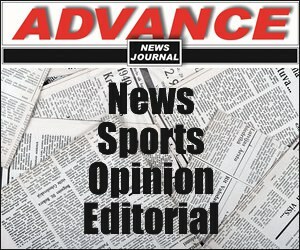 The Edinburg EDC, of which Agustín García, Jr. is Executive Director, is the jobs-creation arm of the Edinburg Mayor and Edinburg City Council. The Edinburg EDC Board of Directors is comprised of Mayor Richard García as President, Harvey Rodríguez, Jr. as Vice President, Elías Longoria, Jr. as Secretary/Treasurer, and Richard Rupert and Dr. Peter Dabrowski as Members. 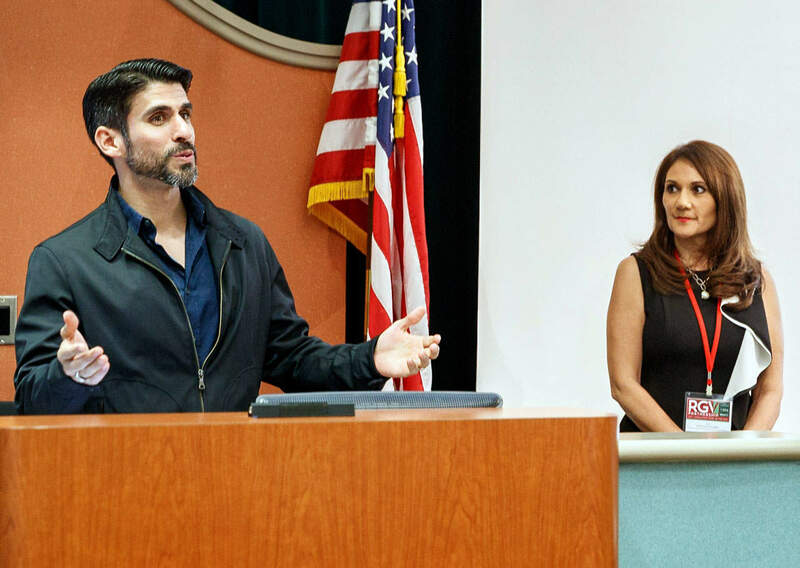 Featured: Rep. Eddie Lucio, III, D-Brownsville, with former Rep. Verónica Gonzáles, D-McAllen, observing, on Thursday, January 26, 2017, addressed lawmakers and their staffs from upstate, renowned Valley health professionals, and area leaders at the University of Texas Rio Grande Valley School of Medicine in Harlingen as part of the Rio Grande Valley Partnership tour for state legislators to answer questions about the state of medicine in the Valley. 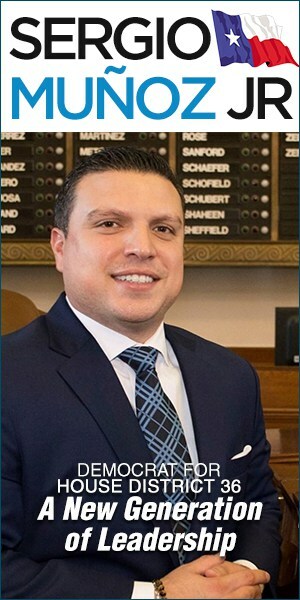 The Mayor and City Council will part of a delegation that will be meeting with state lawmakers in Austin on Tuesday, February 7, 2017, helping promote the community’s and region’s top priorities for the ongoing 85th Regular Session of the Texas Legislature at the Capitol, the Edinburg Economic Development Corporation has announced. Since the mid-1990’s, the mayor, city council, and Edinburg EDC leadership have played active and successful roles in promoting the legislative priorities for their community at the State Capitol. Their efforts have resulted in passing state laws and policies that have had a huge beneficial economic impact on the city. 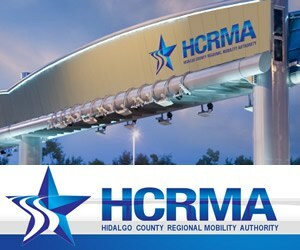 From lobbying on behalf of the University of Texas Rio Grande Valley and its School of Medicine in Edinburg, to helping secure funding that has converted U.S. Expressway 281 into Interstate Highway 69, the mayor, city council, Edinburg EDC Board of Directors, and their respective staffs, have worked with the city’s state legislative delegation on behalf of their constituents. The Edinburg EDC, of which Agustín García, Jr. is Executive Director, is the jobs-creation arm of the Mayor and City Council. The Edinburg EDC Board of Directors is comprised of Mayor Richard García as President, Harvey Rodríguez, Jr. as Vice President, Elías Longoria, Jr. as Secretary/Treasurer, and Richard Rupert and Dr. Peter Dabrowski as Members. Edinburg EDC Board Vice President Rodríguez, Edinburg EDC Executive Director García, and Letty Reyes, Director of Business Development & Public Affairs for the Edinburg EDC, are scheduled to be in Austin as part of Rio Grande Valley Day. 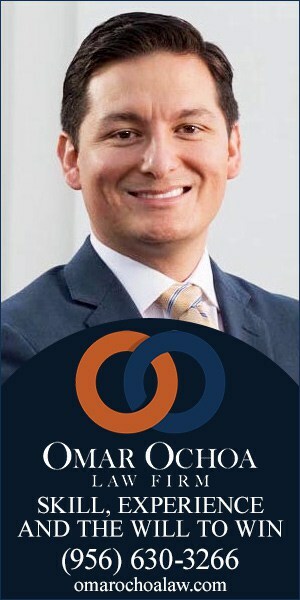 Mayor Richard García and Edinburg EDC Executive Director Agustín García, Jr. are not related. 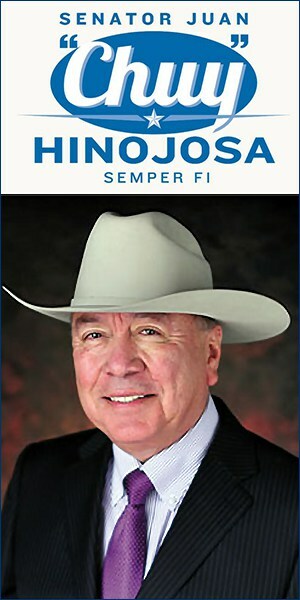 Texas Tribune hosting free ‘Conversation’ with Sen. Hinojosa, Rep. Canales and Rep. Guerra at UTRGV in Edinburg on Friday, August 26 from 11:30 a.m to 1 p.m. 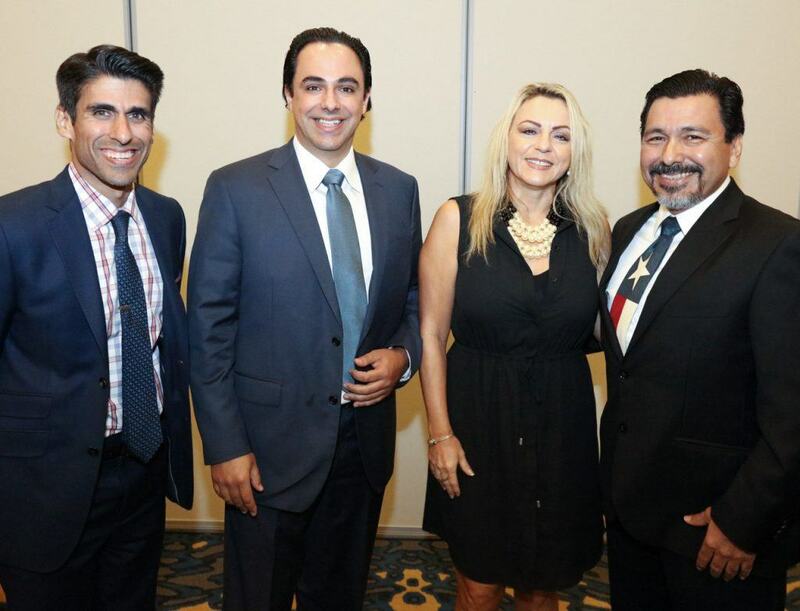 Featured, from left: Rep. Eddie Lucio, III, D-San Benito; Rep. Terry Canales, D-Edinburg; and Claudia and Matthew Martínez of McAllen, on Thursday, August 18, 2016, at the Legislative Report Card luncheon, hosted by the Rio Grande Valley Hispanic Chamber of Commerce, at the Embassy Suites in McAllen. The Texas Tribune will host a free, open-to-the-public lunchtime event — A Conversation with Sen. Juan “Chuy” Hinojosa and State Reps. Terry Canales and Bobby Guerra — from 11:30 a.m. to 1 p.m. on Friday, August 26, at the University of Texas Rio Grande Valley – Edinburg campus. The event will be held in the Community Engagement and Student Success (CESS) Building, located at 407 E. Freddy Gonzalez Drive, near the UTRGV campus in Edinburg. Parking will be available in front of the building (parking pass required; map). General registration is open at texastribune.org/events. 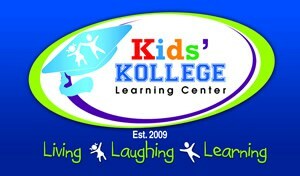 Doors open at 11:30 a.m. Conversation begins promptly at 12 p.m. The discussion will be followed by an audience Q&A session. A light lunch will be provided. This session is presented by Blue Cross Blue Shield of Texas, supported by Methodist Healthcare Ministries of South Texas and hosted by the University of Texas Rio Grande Valley. 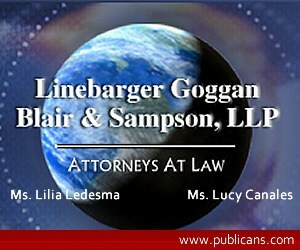 Additional support is provided by the Hatton W. Sumners Foundation. This series of conversations is generously sponsored by AT&T, BP, PepsiCo, Walmart and Southwest Airlines, the official airline of Texas Tribune Events. The conversation will be live streamed at texastribune.org/livestream, and the video will be available for viewing afterward. 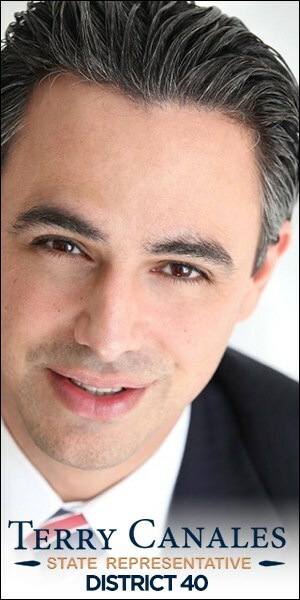 Evan Smith, the Texas Tribune’s co-founder and CEO, will serve as the moderator for the event.